Readers of this blog know that I beat the drum for CSI specification writing format. Yet segments of the US construction market use other formats. In the public works sector, for example, many states, have their own standard specifications for department of transportation (DOT) work. 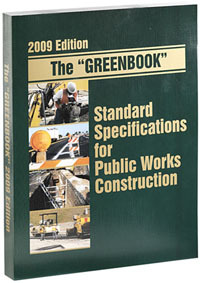 In the West, many municipalities rely on The "Greenbook" - Standard Specifications for Public Works Construction for paving, pipelines, and other civil engineering projects. Specifications like these affect more than just the appearance and structure of a project specifications. For example, contractual and administrative requirements and the relationship between drawings (often called "plans" in engineering documents) and specifications may differ from typical "architectural" specifications. Public work specifications also shy away from reference to proprietary products. If you compete for public works contracts, you may benefit from guide specs tailored to your market. For example, I have recently written guide specifications to help my clients break into Illinois DOT projects and to match Greenbook formats. Call me to discuss your situation - +1 818 219 4937.